Michelangelo’s family, the Buonarroti, once were a rich and important family, with medium size banking activities, but by the time the artist was born, they were not wealthy again. Ludovico Buonarroti, Michelangelo’s father, was a proud man who didn’t accept every job, even if the fortunes of his family had disappeared, thus he was often unemployed. 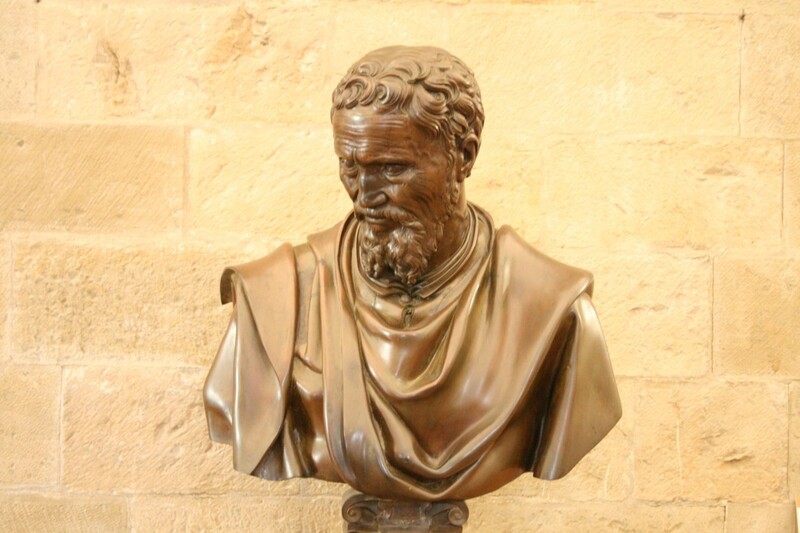 Michelangelo Buonarroti was born in 1475 in Caprese, a small village not far from Florence Italy. His father was serving as the podestà (sort of Mayor) of Caprese. His office expired when Michelangelo, his second children, was just one month old, and the family promptly came back to Florence. Here the children, given the illness of his mother (she died when Michelangelo was six years old), was sent to a wet nurse married with a stonecutter, where he grew up with the noise of hammers and chisels. Later Michelangelo will say that he “sucked milk mixed with marble”, joking on the origin of his talent for sculpture. In Ludovico Buonarroti’s plans, the children had to become a magistrate or work in the public administration; in other words, he tried to direct his son towards a prestigious job, fitting the good name of his family. He was sent to a school of grammar, but apparently he “wasted” his time drawing compulsively. 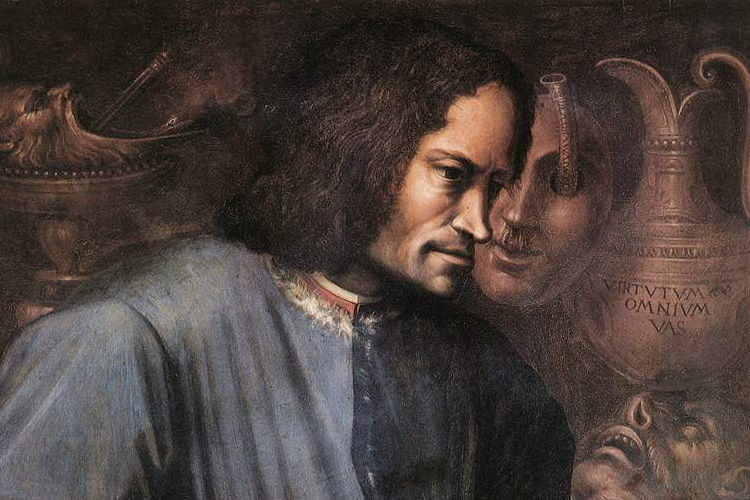 He became friend of a young apprentice painter, Francesco Granacci, who in 1488 recommended Michelangelo to his master Domenico Ghirlandaio: at that time, Ghirlandaio was working on the two most important fresco jobs in Florence: the Sassetti Chapel in Santa Trinita church and the Tornabuoni Chapel in Santa Maria Novella. Michelangelo started his apprenticeship against his family’s will, and he was beaten by his father and uncle because of this. His father acknowledged on his new job only when Ghirlandaio started to pay a salary to the young apprentice: it wasn’t a common thing at that age, where normally an apprentice just had to observe the work of the masters and help preparing colors and plaster for the fresco. Michelangelo stayed one year with Ghirlandaio, receiving very important basics on the art of fresco that will turn useful later. He felt like his talent was wasted in painting, he wanted to be a sculptor, and a great opportunity arose: the Medici family had opened a school of sculpture in the Gardens of San Marco. Michelangelo started attending this school, revealing his talent but also his strong personality: he didn’t accept criticism, but at the same time he often criticized works by other students and once one of them hit Michelangelo with a punch in the face, breaking his nose. Soon enough Lorenzo de Medici noticed the talent of the young teenager. Their legendary meeting happened, according to Vasari and Condivi (Michelangelo’s biographers), in the school/garden where Michelangelo was carving a head of Faun. 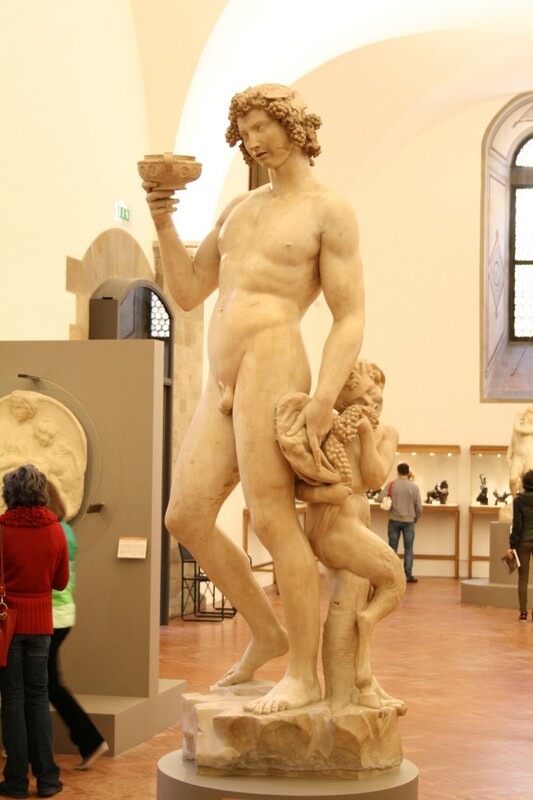 Lorenzo de Medici joked with the teenager, saying that a Faun is an old man and shouldn’t have all his teeth; Michelangelo promptly removed some teeth with his chisel and called back Lorenzo to judge his work again. A plaster cast of the supposed head of Faun is on display at the Uffizi Gallery, a statue by Emilio Zocchi (1861) shows Michelangelo at work on the head in the Palatine Gallery inside the Pitti Palace and another fresco in the Museo degli Argenti shows Michelangelo showing the sculpture to Lorenzo. 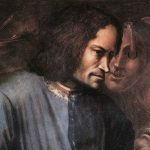 This episode adds to the legend of Michelangelo, but what’s important is that Lorenzo de Medici invited the young artist to his court in Palazzo Medici. Michelangelo, again, received a salary, while his father got a job himself for the Medici family. If the apprenticeship in the workshop of Domenico Ghirlandaio was important for Michelangelo, his stay in the Medici Palace was crucial: there he met the painter Sandro Botticelli, the poet Agnolo Poliziano and all the neoplatonic philosophers that provided a sort of informal continuation of his education, but also grew up with the next generation of the Medici family, in particular Giovanni and Giulio, the future Medici Popes. Lorenzo de Medici died in 1492, and the Medici lost their grip on the city. Just two years later they were banned from Florence, and a fundamentalist monk, Girolamo Savonarola, took the power. Michelangelo left Florence to travel in Venice, Bologna and Rome, and here is where he started to receive important jobs. He carved a Cupid statue for an art merchant, who sold it to the collector Cardinal Raffaele Riario as an ancient Roman work. 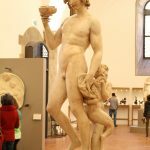 The Cardinal, after the fraud was revealed, wanted to meet the young artist who was so talented to reproduce an ancient work, and after realizing that Michelangelo was unaware of the fraud, he commissioned him a statue of Bacchus (today at the Bargello Museum). Now that he’s introduced in Rome, Michelangelo receives a commission by Cardinal de Lagraulas to work on a statue of Pietà, today in St. Peter’s Church in Rome. After an observer mistook the statue for a work by another artist, Michelangelo promptly carved his name across the chest of the Virgin Mary, and this is the only work signed by the artist in his career. 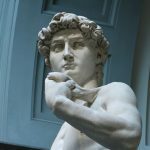 He won’t need to sign his later works because this statue suddenly turned the 24 years old Michelangelo into the most famous Italian artist and as soon as he came back in Florence, he received a commission by the Opera del Duomo for a statue of David. A huge block of marble was laying in the courtyard of the Opera del Duomo since many years. 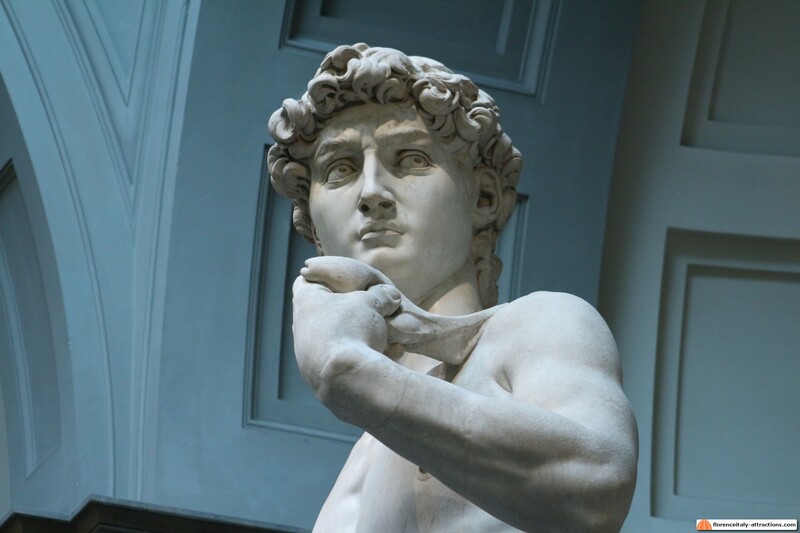 Two artists already tried to start a statue of David, but they abandoned the project because the quality of the stone was too bad. Michelangelo accepted the challenge and worked three years on his David, from 1501 to 1504, without allowing anybody to see what he was doing. 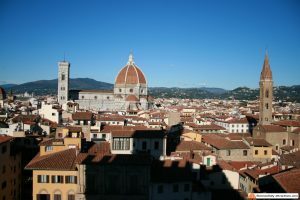 When the sculpture was unveiled, it was so beautiful that nobody in Florence wanted to place it in his planned location, on top of the roof of the Cathedral. 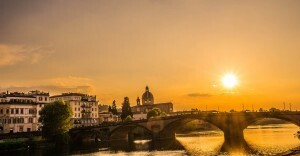 A commission of artists, including Leonardo da Vinci, Botticelli and Filippino Lippi, decided to place the statue in front of Palazzo Vecchio, as a symbol of freedom for the Republic of Florence. The statue, later moved in the Accademia Gallery, is considered the best work of sculpture ever. In 1512, Pope Julius II helped Cardinal Giovanni de Medici to come back to Florence, where the family restored their dominance. 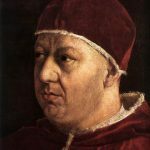 One year later, when Julius II died, Giovanni de Medici was elected Pope Leo X, and Michelangelo came back working in his own town. He worked on the Medici parish church, San Lorenzo, where he designed the tribune in the counter-facade and the Medici Library (Biblioteca Laurenziana). He also traveled to Carrara to choose the blocks of marble in order to build the facade of the church, but the Pope changed his mind: his brother Giuliano Duke of Nemours and his nephew Lorenzo Duke of Urbino died prematurely and he asked Michelangelo to work on their tombs, today part of the Medici Chapels. The Pope himself died in 1521, but another Medici Pope, Clement VII, was elected in 1523 and made sure Michelangelo would continue his work in San Lorenzo. In 1527, Charles V, Holy Roman Emperor, invaded Italy and sacked Rome. 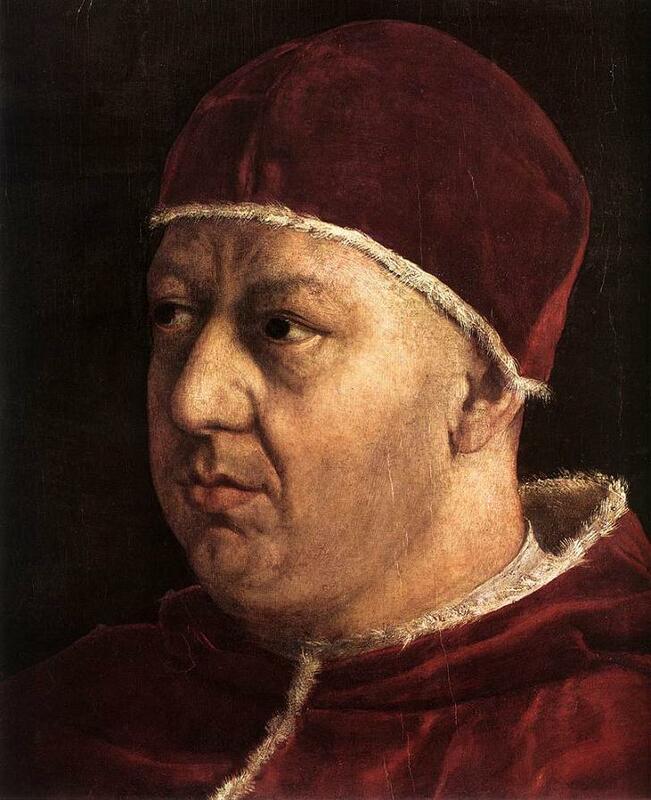 The Republican forces in Florence banned the Medici again, but Clement VII reached an agreement with the Emperor, who promised to help his family take over Florence again. It was no secret that Michelangelo sympathized with the Republican idea, his David statue back in 1504 was there to testify his preference. This time he materially helped the city, reinforcing the defensive wall for the upcoming siege. When Florence fell, Michelangelo was scared of the Medici and went into hiding in the church of San Lorenzo. Only when Pope Clement VII publicly forgave Michelangelo, the artist came out of his refuge and resumed work on the Medici tombs. In 1534, Michelangelo decided to settle in Rome. In the same year Pope Clement VII, just few days before his death, gave him another important job: frescoing the wall behind the altar in the Sistine Chapel. The subject of the fresco had to be the Resurrection, but the next Pope changed it into the Final Judgement. Michelangelo worked to this fresco from 1536 to 1541. This is also when Michelangelo started to write poems: love poems dedicated to a young man, Tommaso de Cavalieri: after some time, Tommaso started to feel uncomfortable because of this and took some distance from Michelangelo, even though they remained friends. Later on Michelangelo dedicated love poems to a woman, Vittoria Colonna. We think Michelangelo never had a physical relationship in his life, and his sexual preferences are still debated. When Vittoria Colonna suddenly died, the artist was left with a sense of anxiety about death coming, and he started writing poems about death and salvation. Frustrated by aging, lacking the energy to work as a sculptor, Michelangelo started to hire some helpers. His last three works are three unfinished sculptures about the same subject: la Pietà. The most intriguing is the Pietà Bandini, in the Opera del Duomo Museum in Florence, intended to be part of the tomb of the artist, whose self-portrait dominates the group of characters. Michelangelo died in 1564, a very long life across the 15th and 16th century. In all his life, he was scared to become poor, and never spent money for clothing or any other luxury. He also financially helped his family, in particular his father and later his brother and nephew, and he left a large inheritance. After his death, the Pope wanted to tribute him the greatest honor: a tomb in St Peter’s church; his family though, and Cosimo I Grand Duke of Tuscany, who repeatedly asked Michelangelo to come back to Florence, organized the theft of his body, carried to Florence in a cart, hidden by groceries. Michelangelo was buried in the Basilica of Santa Croce, in a tomb designed by his biggest fan, Giorgio vasari. Michelangelo is probably the artist who most influenced modern arts; as a model of perfection, he was also imitated by three generations of artists, during his long life and even later. The evolution of the Renaissance was called by Vasari Mannerism. A mannerist is an artist who works in the “manner” of Michelangelo. Even today, after centuries, his works are considered the highest point ever reached in arts.